The recipe for these potatoes comes to me from Bulgaria. They can be served as a delicious side dish or as an appetiser alongside a dipping sauce of your choice. For recipe "Fresh potatoes with garlic and spices" Heat the oven to 200 C.
Wash potatoes well and scraped, then dried in kitchen roll. Peel the garlic and cut into thin slices. In a large bowl, stir the garlic, olive oil, salt, black and red pepper. Thyme was washed and dried, after which the leaves are removed and half of them were added to the garlic mixture. In a bowl, pour the potatoes and mix everything well. Potatoes are loaded into a fireproof dish. On top, sprinkle with pine nuts. 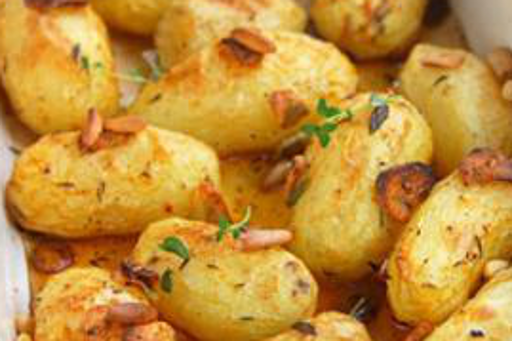 Fresh potatoes with garlic and spices bake 40 minutes, stirring 1-2 times. When serving, sprinkle with the remaining thyme. Feel free to vary the herbs and spices to make this excellent dish your own.